Innosilicon, designer of the industry leading cryptocurrency mining ASIC products, today announced that it has achieved a industry record breaking performance in its Terminator Sha256 Bitcoin mining ASIC series. To highlight the event, a North American Mining Summit is set to take place in Montreal and Toronto on August 13-15. 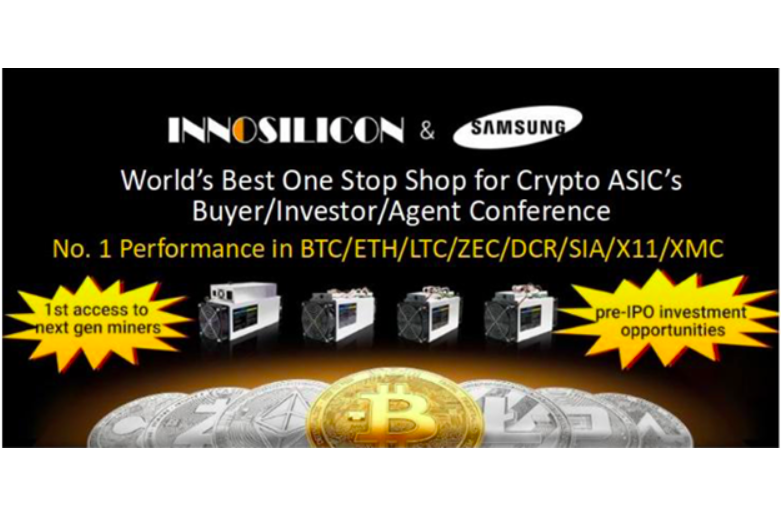 Innosilicon has worked closely with Samsung on their FinFET technology to optimize power efficiency to levels never before achieved in a miner ASIC. Combined with ASIC customization abilities, and flexible business models, the company boasts a solution that delivers the highest ROI on the market. “Improving power efficiency by as much as 30% is nothing short of phenomenal in today’s competitive market” explains Roger Mao, Vice President of Engineering at Innosilicon. The Chinese one stop shop for the best Crypto ASIC miners is looking to partner with leading global technology corporations, to deploy their high yield mining equipment on a large scale in Canada. “We are very pleased to provide the utmost low-power solution to Smart Server through Innosilicon to ensure very competitive equipment life time,” said Ryan Sanghyun Lee, vice president of Foundry Marketing Team at Samsung Electronics. Cloudminter is a Canadian cloud computing corporation who offers high density data center facilities, cloud mining and mining equipment. Cloud Minter is the source of this content. This press release is for informational purposes only and should not be viewed as an endorsement by CoinIdol. We take no responsibility and give no guarantees, warranties or representations, implied or otherwise, for the content or accuracy. Readers should do their own research before investing funds in any company.